At the northern end of the Rue Blanche is a dark, thoroughly gothic townhouse. It is rare to see such townhouses in Paris, but this one also sports a rather curious plaque. This is not a standard blue plaque, but is instead a message chiselled into the building itself as if it were a tombstone. 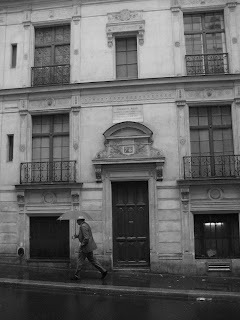 This building is the Hôtel Ballu, which was designed and built by Théodore Ballu and which became his home. It seems unusual therefore that the plaque celebrates his death and not his life in this house, but a brief study of the Mr Ballu’s career gives an indication as to why this should not be a surprise. Théodore Ballu was an architect and planner whose most famous constructions are the rebuilt Hotel de Ville and the Trinité church. Both buildings were constructed whilst he was the Head of Public Works for the city of Paris in charge of buildings related to culture and religion. He was also involved in the construction of Saint Ambroise and St Joseph, the belfry of Saint-Germain l’Auxerrois, and was largely responsible for the typical classical style of many of the churches in Paris. What sets him apart from his contempories however was his passion for gothic art. He was employed by the city of Paris from 1860 to 1876, a time when revolution was in the air. Indeed, the Prussian invasion and the Commune uprising occurred in 1871, and his rebuilding of the Hotel de Ville came after the original building had been burnt down by the Communards. At a time when people were turning their backs on religion and the state, and Haussmann was ripping the medieval heart out of the city, Ballu was erecting buildings that were heavy with sculpture, Byzantine domes and Romanesque arches. 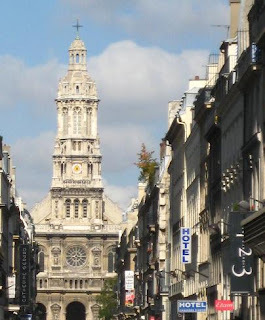 Whilst Haussmann was creating broad new perspectives throughout the city, Ballu was constructing the single lean tower of the Trinité church which mirrors the perspective of the Rue Chausée d’Antin, a narrow ancient street. Whilst we cannot say that Ballu has been forgotten today, it is clear that his reputation and renown are not as great as the legacy he left Paris. His constructions were works of art, but an art that belonged to another time. His decorative buildings were soon superseded by the pure lines of 20th century modernism, and not long after his death, gothic revival architecture dropped out of fashion. Time is never kind to those who were once at the pinnacle of a movement. It is perhaps fitting that after his death he was taken from his house to another gothic monument, the Père Lachaise cemetery. It is said that he designed his own tomb here, and visiting it, it seems clear that he envisaged it as a celebration of his and his family’s legacy. It is sad to see it today in rather a forgotten corner, and it’s a cruel irony to see an architects tomb being held up by scaffolding joists. It is even sadder though to find that the name Ballu is absent from all Père Lachaise maps. Excellent, well-researched item... and I love the main photo! Doisneau eat your heart out! Thanks Mélisse - and your English is just fine! 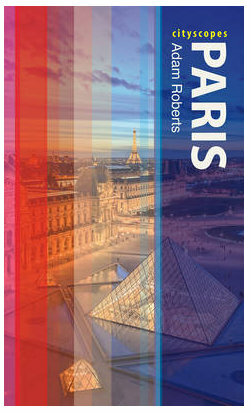 Very interesting and complete, including the Père Lachaise visit! The more I read your posts, the more I appreciate your blog!! 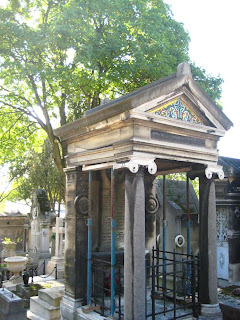 The Père Lachaise visit became essential for me, and it is really the most poignant aspect. He was clearly a man who believed that he deserved posterity, but who history has largely forgotten. It's nice to read something about the Trinite church after having passed it so many times. I always note how different it is from Notre Dame de Lorette, which is so close to it. Yes Laurie, it is an interesting contrast. In less than 40 years (and about 200 metres! ), architectural tastes had gone from a pure neo-classicism to this rather extravagant gothic revival. I think that La Trinité is certainly the more spectacular anyway.